I’m taking a one post break from Exploration Age to write a post for the RPG Blog Carnival. This month’s theme is about virtual tabletop gaming, a subject near and dear to my heart. Like many people, I go wherever I can make a living. I’ve lived all over the East Coast – New York, Philadelphia, Atlanta, and now Washington, DC. I came here a little over two and a half years ago to work at a place I love. However, working in the heart of DC makes it very difficult to find a game to join. I tried organized play events, but the game stores within the city of DC closed by 7 and I work until 6. The stores outside the city were unreachable in a timely manner due to DC’s infamous traffic. I tried posting games on meetup, but alas those fell through. My travel to and from Philadelphia to maintain my long-distance relationship made meeting on weekends impossible. For a while I despaired. I would never play a tabletop RPG again! Cue dramatic sting. Then there was ray of hope. Cue choir. Wizards of the Coast introduced their virtual game table and I gamed more often and consistently than I ever have. Virtual tabletop gaming saved my hobby. For realsies. After a time of playing with the platform Wizards created, which required one to be a D&D Insider subscriber, I started to bemoan the limited selection of minis and map tiles. For some of my players with older computers, the table was sluggish and bogged down their connections. Then, the final dagger – was not going to continue supporting the table and we would have to look elsewhere to game. First of all, it’s free. You can support roll20’s development with an upgraded account if you wish (and I suggest you do if you rely on the service and/or would like cool extra features), but no payment is required. Guess what you get for $0? 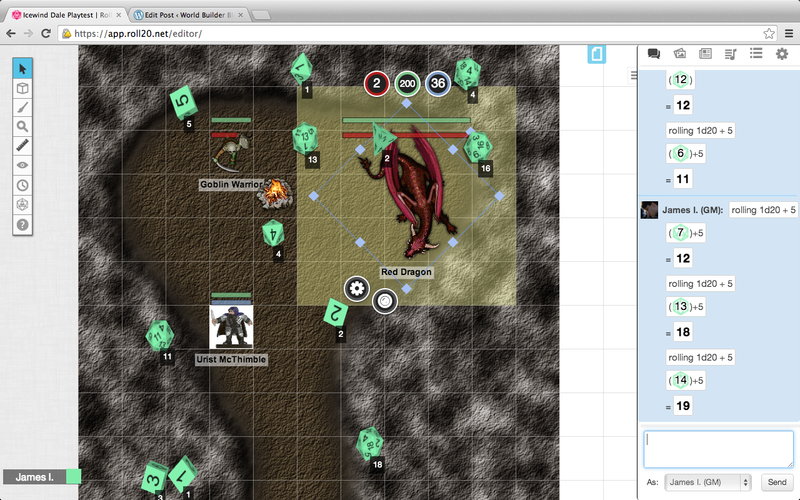 A virtual tabletop that supports all systems, grid maps, and hex maps. 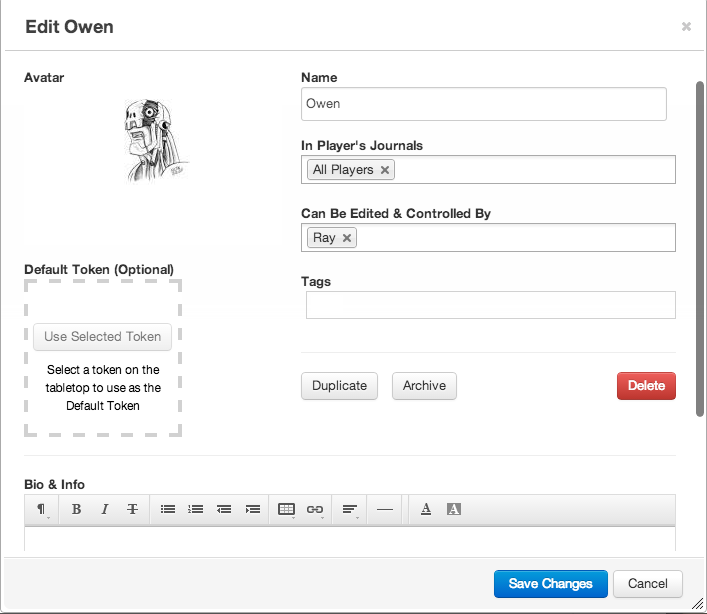 Players can have journals that track character stats, keep story notes, and share notes with just the GM. Each player’s journal can be linked to his or her mini. Just a fraction of what you can do in the journal. The selection of free map tiles and minis is through the roof, and more are available for a nominal fee (from a store to which anyone may submit art). Searching for the tiles and minis you want is fast and easy, making improv a dream. I swear, making a map in roll20 looks better and is so much faster than drawing it out at the table. Again, a fraction of the options that appeared in literally a second when I searched “goblin” in the token library. All these are free. 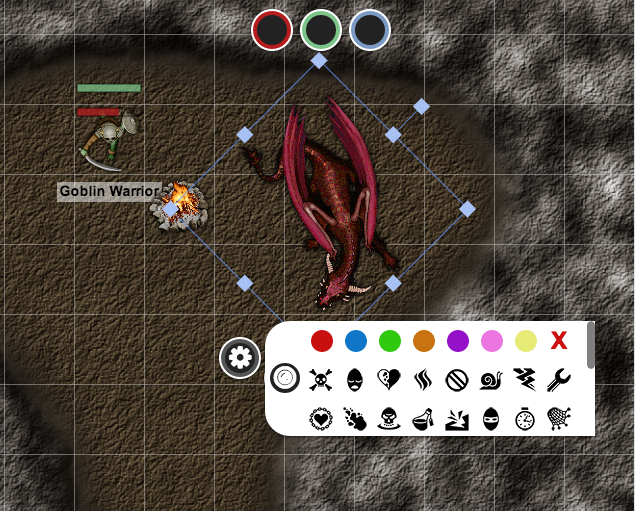 If you don’t find the tiles or minis you want within roll20’s database, you can import your own images and use those. You can easily add stats, auras, markers, and status effects to any mini. Customizing a mini’s stats and auras. Once again, just a fraction of the markers you can add to a mini with minimal effort. 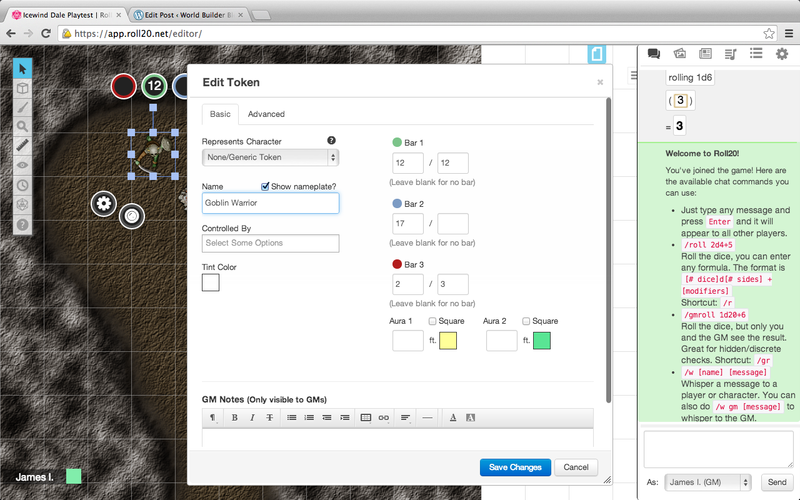 GMs can easily communicate messages and rolls with just one player via IM. GMs can share handouts and art with one or more players. Movement and distance is easily tracked. Lighting effects and fog of war options are simple and easy to control. A whole host of command options exist for rolling different combinations of dice. 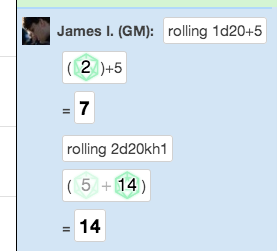 I’m not just saying roll20 can do the math of 1d20+5 for you. I’m saying it can roll 2d20 and take the higher (or lower) result and then add 5 with just a few quick easy to learn keystrokes. Simple commands for complex dice rolling and math! No, roll20 is not paying me. Don’t like key strokes? Macros. That’s right, easily programmed little buttons that with one click can give you result of attack and damage for any attack, check, saving throw, etc. This is especially useful if you player 4e and have players with a lot of powers or for spell casters. Pro tip: encourage your players who are bad at math or take forever going over their character sheet looking for an option to set up macros. This will speed up play (again my 4e combat never moved so quickly at a table). Once your macros are easily setup, simply click on the character to have your options appear at the top of the screener and click what you want to roll. Bam. Done. A jukebox feature allows you to play music from a huge library at the table. Deck of Many Things in action. Lots of neat visual features like virtual dice and special effects (like a mini breathing fire) add to the fun. Rolling dice onto the minis, just like real life, only it doesn’t mess anything up. 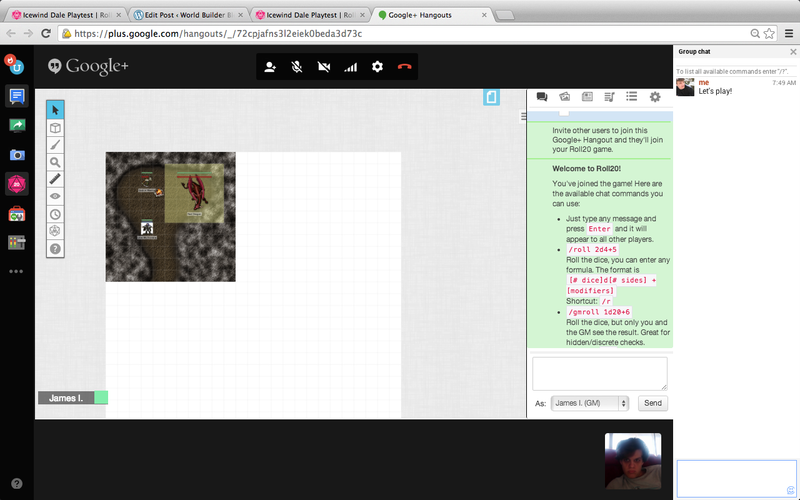 You can launch roll20 through Google+ Hangout as an app. So you get all the features of a Hangout (or you can simply play through roll20 itself which has webcam, voice, and text capabilities). 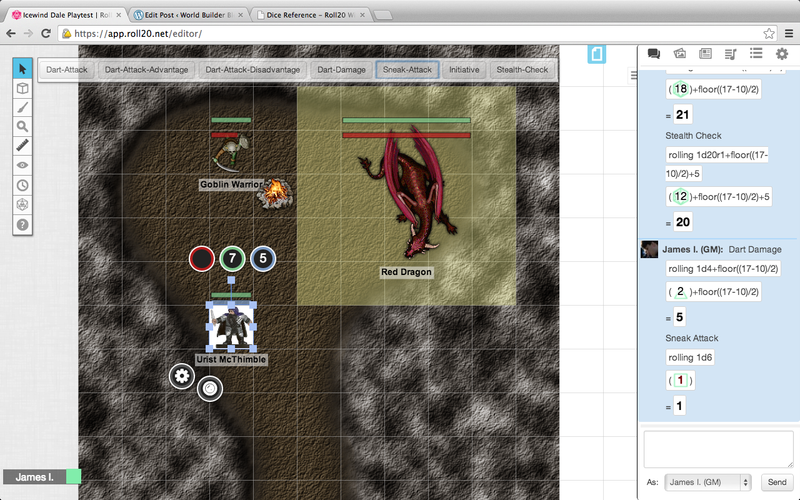 If you don’t know anyone nearby or far away, roll20 has a whole community of folks just like you and the message boards to find them . So find a game or post for players and get rolling. There’s also a team constantly working on making roll20 a bigger, better platform with consistent updates and upgrades. They’re also responsive to any questions and concerns you may bring to them via Twitter or forum . So whatever your game, if you can’t gather folks around a table, see if you can all sit down to a virtual one. I recommend roll20, but there are tons of others out there. Explore and play! This day in age, no gamer need be gameless. The only downside is you’ll need to buy your own snacks. How are you like D&D Next so far? Savage Worlds is pretty awesome. Have you tried 13th Age? That sounds incredibly awesome. I’ve got lots of local gamers in my area, so I’ve never had to search for online options… but my current home game often runs into scheduling issues (pfft… what is this whole “being adults with real lives” crap all about? ), so Roll20 might be a good option to try. Yeah being an adult and having a job makes the get together difficult, but roll20 does make it easier, especially when people can be in their own houses and don’t have to hire a sitter and can fold laundry, etc. while playing. Thanks for playing, so to speak! It’s one of many bullets, but the integrated video (via Hangouts) and Roll20 gametable function is the real selling point for me. Absolutely! That was a real smart idea. I have not really paid any attention to D&D Next since the very first playtest materials they released. I know I will look at it when it is released as a finished product, but I have been happy with SW. Combat is less tactical than D&D, but it is soo much faster. When we play online at night for 2.5-3 hours, a 4th Ed fight fills the whole session it seems, which does not happen wth SW. I have not done 13th age, no. I looked at Monte Cook’s new Numenera game, though. I had also given a lot of thought towards True20. Yeah I love the tactical nature of 4e, but combat is so much faster in Next and that makes it great. We can get through a small dungeon in a 3 hour session no problem. Gotta love that! Exactly…I’m not a fan of fights that drag on too long. We are in the middle of a fight in Savage Worlds for my campaign that has stretched into a second night after already having 1-1.5 hours. I’ll be adjusting things for the rest of this adventure, but its because of the shear volume of allies and NPC’s the party is trucking around with. The party is with 30 other NPCs and they are being attacked by 60 foes I think. All that being said, it will still likely only be another hour to finish the fight. A fight with 90 NPCs plus PCs would be simply inconceivable in 4th Ed. Wow! That’s certainly true about 4e. For big battles like that, I generally make up what happens (ah, these five guys go down!) rather than try to make every little move happen in accordance with the rules. I applaud your dedication, sir! 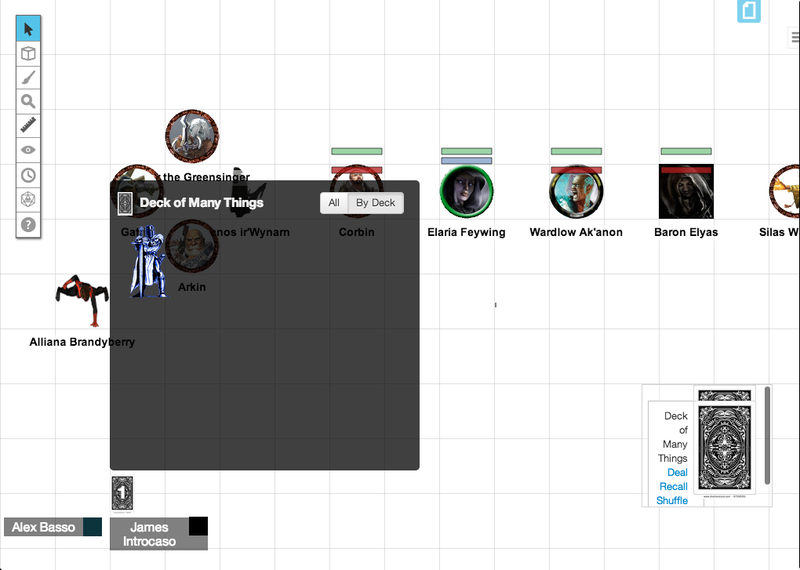 I’m currently running an All Flesh Must Be Eaten game using Roll20 and I found it very easy to set-up characters and their associated macros. I’m toying with the idea of publishing more of my macros on my blog.